Where Should I Stay in Yosemite? Yosemite and vicinity are blessed with lodging that ranges from world-class beauties like the Ahwahnee and Tenaya Lodge to simple tent cabins that provide a more affordable way to sleep in comfort amid the beauty of the park. We cover all of the lodging in Yosemite here, including few outside-the-park options that offer rooms within 10 or so miles of the park boundary. And, of course, we point out all of them in the course of our Just Ahead audio tour of Yosemite. No matter where you’re headed, be sure to make reservations well in advance. Though it’s possible to get lucky, you should never count on it. The Ahwahnee Hotel (now called the Majestic Yosemite Hotel) blends beautifully with its environment. Photo: Kenny Karst/DNC Parks & Resorts at Yosemite, Inc. The Ahwahnee Hotel (now known as the Majestic Yosemite Hotel), is the marquee lodging in Yosemite, if not the entire national park system. Its log-and-stone construction and Native American décor honor the beauty and history of the surroundings. And what majestic surroundings: Floor-to-ceiling windows frame views of Half Dome, Glacier Point, and the Royal Arch Cliffs. Massive sugar-pine beams and dark, ponderosa pine paneling add to the elegant rusticity of the place. The Ahwahnee has 99 rooms and 24 cottages, but its greatness lies in its public spaces—the Great Lounge, dining room, solarium, and bar—and the way its architecture blends in with its backdrop. All of that is testimony to the skill of its architect, Gilbert Stanley Underwood, who also designed lodges in Zion and Bryce Canyon National Parks. Whether or not you choose to stay there, the Ahwahnee is worth a visit—in fact, we’ve included it in our Best of Yosemite listings. 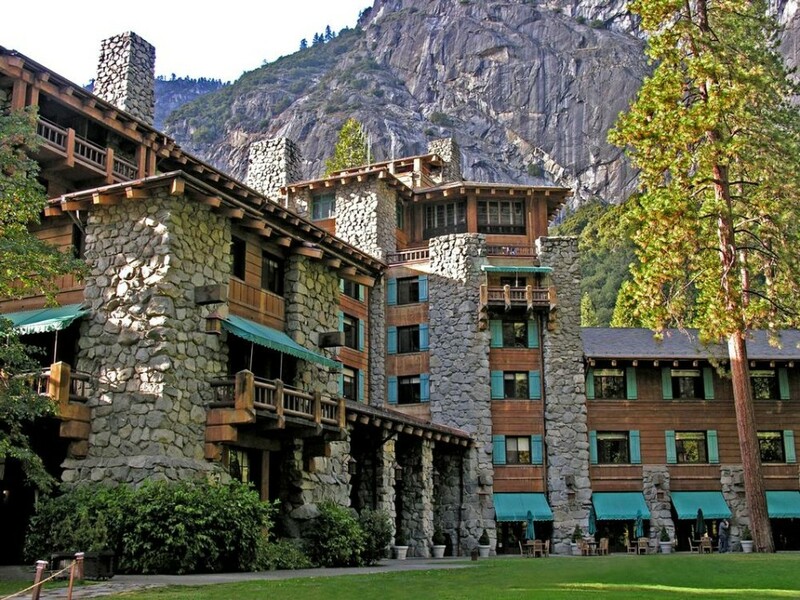 Hot tip: The Ahwahnee’s cottages were recently re-done to better reflect their late-1920s vintage. They’re probably the most desirable rooms in the park. Yosemite Valley Lodge strikes a compromise between the expensive Ahwahnee and the summer-camp flavor of Curry Village. The location is brilliant—as the name suggests, the sprawling, 245-room lodge is near the base of Lower Yosemite Fall in the heart of Yosemite Valley. With two restaurants, bike rentals, and an activities desk, it’s very busy place, but an ideal home base for exploring all that Yosemite has to offer. Where Should I Camp in Yosemite? This post is part of Just Ahead’s Yosemite Trip Planner—our guide to what you need to know to plan your trip to Yosemite National Park. Click here to see the complete series. And be sure to download our Just Ahead smartphone audio tour of Yosemite before you head to the park. Camping under the stars in Yosemite sounds like a dream, and it is. However, it’s a dream shared by many others. Although the park has 13 campgrounds, many of them are seasonal, and most are in great demand. When it comes to deciding where to camp in Yosemite, the key is to plan ahead for campgrounds that take reservations, and to arrive early for campgrounds that don’t. The park’s most popular campgrounds take reservations through recreation.gov, but to nab a site in one of them, you need to think in terms of getting tickets for a big rock concert. Get on the website ready to start clicking promptly at 7 a.m. Pacific time on the 15th of the month, five months in advance of your month of arrival. Sights like this are not far from your tent flap when you camp in Yosemite. So what should you do if you arrive during a busy season with no reservations? If you have cell-phone reception, you can call the park’s campsite availability hotline at 209-372-0266. Most likely it will steer you to one of the campgrounds outside Yosemite Valley that has sites on a first-come, first-served basis. Best advice for getting one of those sites is to first verify that the campground is open (call the hotline or check with a ranger), and then to arrive by 8:30 or so in the morning. Sites generally fill up by noon, earlier on weekends. The one Valley campground that is first-come, first served is Camp Four. The same advice applies: Get there early. All campgrounds accept RVs unless noted in the write-ups that follow. As for amenities, as a general rule, expect tables, fire pits, running water, toilets, and bearproof food lockers. Exceptions are noted below. Naturally, Just Ahead points out all of these campgrounds as you drive through Yosemite. The Pines Campgrounds: Upper Pines, Lower Pines, and North Pines, are what most people think of when they think of Yosemite camping: big spaces under tall pines with views of Half Dome and Glacier Point. The three campgrounds are adjacent to one another near Curry Village at the east end of Yosemite Valley. They have 379 sites altogether, and many will accommodate large RVs. Upper is open year-round; the others are open roughly from early spring through mid-fall. These campgrounds are especially suitable for families and people who enjoy a very social camping atmosphere. All sites can be reserved through recreation.gov. Camp Four is a walk-in campground for tents only, but the sites are quite close to the parking area. Think car camping without your car right next to your tent. The campground is open year-round, with 35 sites. As we describe in our Best of Yosemite post, Camp Four is the center of Yosemite’s rock-climbing culture, and primarily populated by climbers. Word of Just Ahead’s revolutionary smartphone audio guides is really starting to spread. We caught the attention of the New York Times with the release of our newest guides, Yellowstone and Grand Teton National Parks, and the Times writes about them in today’s In Transit blog. Just Ahead is featured on Randy Sharman’s “The Informed Traveler” radio show on National Travel Radio. Randy conducted an eight-minute interview with Just Ahead’s editor and lead writer, Bob Howells. Click on the image below to listen. What Are the Best Sights to See in Yellowstone? This post is part of Just Ahead’s Yellowstone Trip Planner—our guide to what you need to know to plan your trip to Yellowstone National Park. Click here to see the complete series. 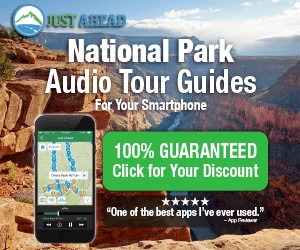 And be sure to download our Just Ahead smartphone audio tour of Yellowstone before you head to the park. Yellowstone is a massive national park, its 3,468 square miles teeming with geysers, grizzlies, and one gorgeous scene after another. Just Ahead’s smartphone audio tour guides travelers along famed Grand Loop Road in a giant figure eight through all of the the park’s many regions. But deciding where to go with limited time can be daunting. You could take several trips here and not see it all. Fortunately, we’re intimately familiar with every one of Yellowstone’s 310 miles of roadway and will tell you the sites you shouldn’t miss, plus a few lesser-known gems many visitors overlook. Every Yellowstone visitor goes to Old Faithful, and sometimes it feels like all at once. We recommend escaping the crowds for a unique perspective on the area’s many thermal features at the Observation Point Trail, which offers a raven’s-eye view of the famed geyser and the Upper Geyser Basin. Printed guides for the Upper Geyser Basin trail system, including Observation Point, are available at the Old Faithful Visitor Center. You could easily spend an afternoon here touring some of the park’s most beautiful pools and watching geysers erupt. Mammoth Hot Springs in the northwest corner of the park isn’t as world-famous as Old Faithful and its surrounding geyser basins, but it’s equally stunning. Raised boardwalks lead through steaming, pearly terraces that change shape and color every year like a living sculpture. The nearby village of Mammoth features a renovated visitor center inside historic Fort Yellowstone, a fascinating relic from the pre–National Park Service days when the US Army oversaw the park. The drive between Lake Village and West Thumb leads along the shoreline of this massive mountain jewel of a lake, the largest high-elevation lake in North America. Just Ahead will point out the best places for lakeside lunches and short hikes, as well as a very cool side road that crosses a narrow sand bar with lake water on both sides. The Upper and Lower Falls in the Grand Canyon of the Yellowstone are among the park’s top highlights, and our favorite perspective on them is from Uncle Tom’s Trail. This one-of-kind, half-mile path descends 338 steps down the wall of the canyon to a platform where you can literally feel the thunderous power of Lower Falls. Where Should I Stay in Yellowstone? This post is part of Just Ahead’s Yellowstone Trip Planner—our guide to what you need to know to plan your trip to Yellowstone National Park. Click here to see the complete guide. And be sure to download our Just Ahead smartphone audio tour of Yellowstone before you head to the park. In a park rife with natural wonders, it’s pretty hard for anything man-made to compare. But the best lodges in Yellowstone nearly justify a visit unto themselves. And if you can’t get in, or you prefer less expensive digs, the park’s many 1950’s-style motor lodges and tiny cabins—and the tourist towns orbiting Yellowstone—all have standard hotel and motel options. All lodging inside the park is operated by Xanterra and can be reserved at www.yellowstonenationalparklodges.com or by calling 866-439-7375. Here are the best options in the park and an overview of the surrounding communities. With its namesake geyser erupting just outside, this is the original great park lodge of the West. Built seven stories high in 1903 from lodgepole pines felled in the park, it’s the largest log building in the world. It’s worth a visit even if you’re not staying the night just to see the towering lobby and its fireplace built with 500 tons of volcanic stone. Historic Old Faithful Inn is the park’s signature lodging. The most elegant lodging in the park, the 196-room Lake Hotel originally served wealthy 19th-century travelers, including US presidents and European royalty. Its massive Southern colonial architecture feels a bit out of place in Yellowstone, but all will be forgiven as you sit in the sunroom looking across the lake to the sounds of live orchestral music. Feel free to walk through whether you’re a guest or not. For a more rustic and remote Yellowstone experience, visit humble Roosevelt Lodge in the park’s less-traveled northern reach. Not much has changed here in the past century, and that’s just how lodge guests like it. Some rooms have wood stoves for heat, and you can hire evening wagon rides to outdoor steak cookouts for dinner. It makes a relaxed, quiet base for exploring the Lamar Valley and surrounding wildlands. Where Should I Camp in Yellowstone? For many Yellowstone enthusiasts, nights spent camping are the only way to visit America’s first national park. After a day exploring the park’s many wonders, it just feels right to drift to sleep to the sound of a nearby creek or the breeze through the treetops. Yellowstone has 12 campgrounds ranging from 430-site tent cities to small, out-of-the-way wilderness enclaves. All have drinking water and most sell firewood. Park concessionaire Xanterra manages five large campgrounds in the heart of the park, which feature hundreds of sites, flush toilets, and sometimes showers. They are reservable in advance through www.yellowstonenationalparklodges.com, or by calling 307-344-7311 (future reservations) and 307-344-7901 (same-day reservations). The seven campgrounds managed by the National Park Service (NPS) are smaller, less developed (most have only vault toilets), and often more remote. They are first-come, first-served, and often fill completely by early morning. To check which campgrounds are full, you can click here for a handy Park Service campground information web page. Some campgrounds have flush toilets and showers, others are simpler with vault toilets and creeks. Here’s our guide to Yellowstone camping. Popular with fisherman and families, this large, popular campground offers the easiest access to Old Faithful, 17 miles, and the West Entrance, 13 miles. Walking trails lead to the Madison River, and bison and elk are abundant in nearby meadows. Nightly ranger talks are held at the amphitheater, and kids can sign up for the Junior Ranger program at the adjacent Madison Information Station. There are vending machines, but the nearest real services are in West Yellowstone or Old Faithful. Flush toilets, no showers. Bison roam the meadows near Madison Campground—and sometimes the campground itself. One of the park’s nicest campgrounds, this has sites on the Gibbon River and others near a large meadow where bison can be seen. Guided ranger walks lead through the nearby Norris Geyser Basin, which is reachable via a one-mile walking trail. The charming Museum of the National Park Ranger is also a short walk away. Flush toilets, no showers. Situated on the edge of Mammoth village, this is a great spot for visiting its namesake hot springs, which are reachable by an easy walk. This is the only Yellowstone campground open all winter and its relatively low elevation (for Yellowstone) often makes it the warmest campground in summer months. It has flush toilets but no showers, and the road is close by, so there is some traffic noise. Rangers talks are held nightly in summer. This feature article in the Los Angeles Daily News tells the story behind Just Ahead, the smartphone app that delivers narrated audio tours of national parks and scenic highways. Click on the excerpt below to read the full article. Grand Teton National Park is Just Ahead’s newest smartphone audio tour, joining its fabled neighbor, Yellowstone National Park, in our growing collection of narrated guides to America’s most gorgeous destinations. It’s hard to beat Grand Teton for scenic driving. The park has 152 miles of paved roads that deliver views of the majestic Teton Range, follow the course of the winding Snake River, and bisect the vast, sagebrush-dotted valley known as Jackson Hole. Just Ahead guides you along all of the most scenic routes, pointing out the marvels as they appear. And in between, you get tales of the park’s human history, dramatic geology, and abundant wildlife.